In case anyone runs across this, after CrashPlan 3.3 likes like the folks at Code42 compiled their code using Java 6. You have to get Java 6 on that machine and then update the LaunchDaemon to point to the 1.6.0 directory. Then had to edit your LaunchDaemon to point to the new directory. I’ve got two domains that we are consolidating over to just one. One is running AD 2003, and has three child domains. The other is a 2008 AD, and the new domain is 2008 R2. For the sake of this post, I will be calling the domains AD2003, AD2008, AD2008R2. I have a brand new CUCM 8.6.5 cluster I’m bringing up, and need to authenticate users on all three domains until my migration is complete. 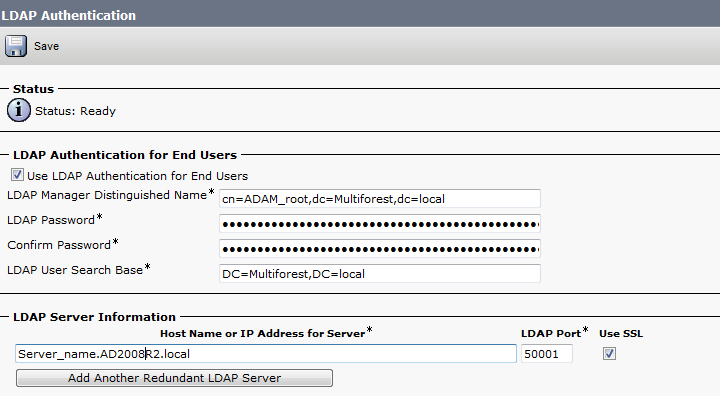 I have a root CA already configured on my new AD2008R2 domain, so LDAP over SSL is the way I’ll be configuring this. First off, I’d like to post the websites and give the people who wrote them thanks for doing so. I would be completely lost without their help. 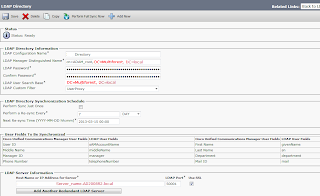 Firstly, Greeshma on the Cisco KB pretty much lays it out as to how to do this, however, there’s a lot that is not covered and of course would be impossible to cover every single deployment scenario for this. So I’m just going to cover how my deployment went and what I needed to do to make it work. I’ll shorthand a bunch of it and refer back to the links above, but will include some screenshots on stuff that isn’t covered. 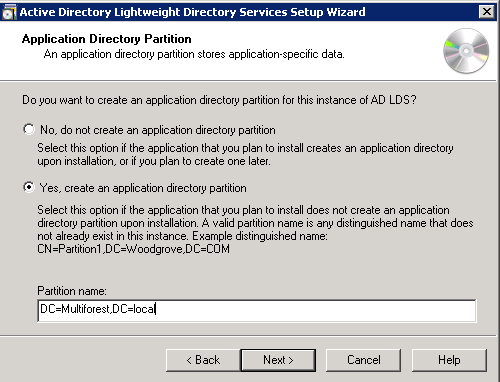 One thing I didn’t understand from step 8 on this procedure was that the partition name is a brand new partition. 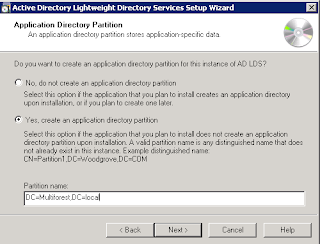 The KB names the partition the same as the host AD DC domain. For me a more descriptive “DC=Multiforest,DC=local” works better. 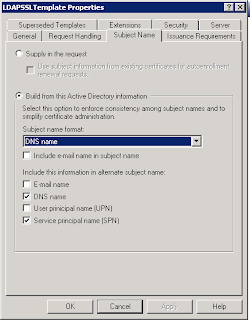 AD LDS Administrators, I chose AD2008R2\Domain Admins for my instance. CoreLAN team does a great job explaining exactly what you are doing. Definitely a good read if you need some more info on this. Referencing the Cisco KB article, I ran steps 1-7 for my first domain AD2008R2. Please remember that step 3 references your target schema which is the standard AD on each domain (going through LDAP port 389) and the base schema is the new AD LDS on port 50000. 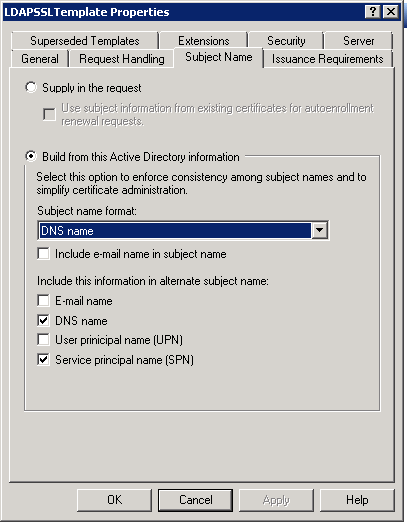 Ran Step 8 (simple,) and ran step 9 for the first domain AD2008R2. Now we need to rerun steps 1-7 for my next domain, AD2008. Then you can skip step 8, and run step 9. One thing to note here is that I got an error on step 9 for the second domain. So I ran the ldife command with a “-k” to ignore the errors and keep processing the other entries. I tried updating the schema using ADSI and then restarting the Multiforest AD LDS instance, but I still got that error on the third domain too. Not sure what that exact error is there, or if it even matters. I then finally ran steps 1-7 from the Cisco KB for my third domain, and ran step 9 with the –k switch. That’s it. My new AD LDS instance includes all the schema extensions from my other domains, so now we are ready to import users. In the Cisco KB, extending the AD LDS Schema with User-Proxy is pretty simple, just download the file and run the command mentioned. No need to change anything. Since Greeshma used the same AD name on his AD LDS instance, I got a bit confused here. Doug from www.thegeekispeak.com cleared things out for me. His detailed look at MS-AdamSyncConf.XML is of great help. For my setup this was the first config file. I have a IT OU that I’m only synching in this case. From here, I’m sure you know what I did for my third domain. 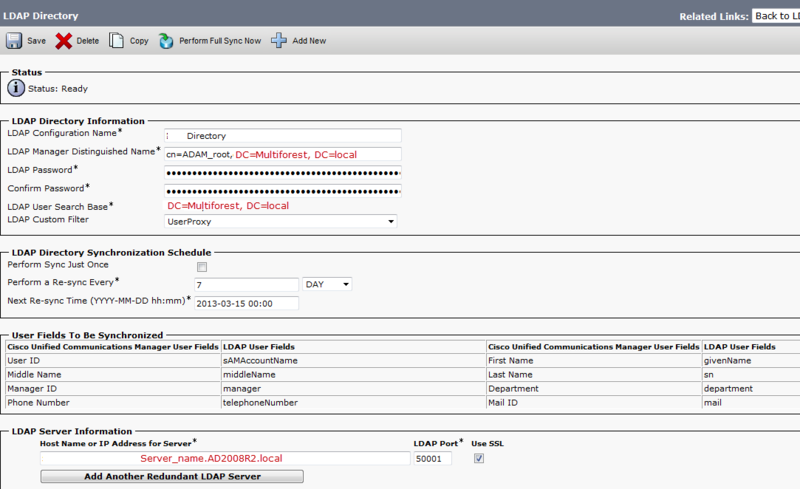 After the config setup above, just run steps commands from the Cisco KB on this section, and you should be good. Create the appropriate BAT file for and that ends this section. The next section, is pretty much as is. 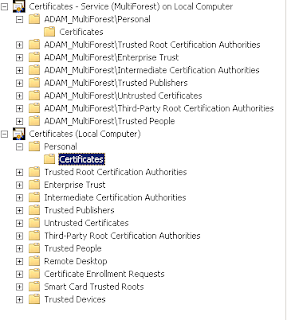 For the LDAP over SSL certificate use the following links to get yourself all set up. One thing that the above link didn’t include a screenshot of was the subject name config on the template. Please see below for that. I went with DNS name for the Subject name format. Here’s another link from Microsoft. One thing I would like to mention is that I had to create the certificate under the “Local Computer” personal store, then I had to move it to my Multiforest instance personal store. I tried exporting it but it wouldn’t work. 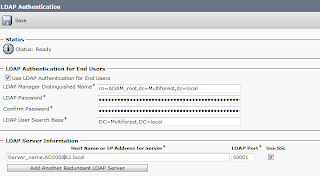 Then after you’ve restarted you AD LDS instance, verify LDAP over SSL works by using the ADSIedit or another LDAP tool, such as Softerra. Here are some screenshots that the Cisco KB was missing when I went through it. After that just followed the rest of the KB and it worked for me.